I have lived most of my life in an uncommonly beautiful place of wetlands, farmland, endless sea and sky. I also travel to find other places of similar and contrasting aesthetic inspiration, in the tradition of Thomas Moran. My landscapes reflect my longtime devotion to preserving and interpreting these visual impressions. 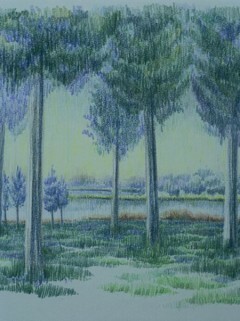 Detailed colored pencil drawings, photographs and multiple site visits are sources for the tapestry designs. 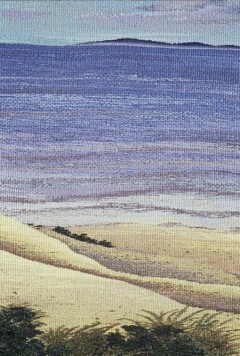 I weave on a high warp tapestry loom using wool silk and linen in varied textures and hues to form the foreground, while fine gradations of wool and silk capture the interplay of the ever-changing relationships of Earth, Sea and sky in the distance. While my artistic vision is landscape based, abstraction that has its roots in tapestry evolve as I expand the possibilities of my medium. As I photograph places of intrinsic beauty and grace as an informational resource for my tapestries I have found some of the photographic images are a beautiful art form as they are. They capture an atmosphere, a light, a form particular to photography.